Captain Nolan is an Irish Canadian who catches marine animals in order to pay off the mortgage on his boat and eventually return to Ireland. Nolan's crew is currently looking for a great white shark for a local aquarium, but a scientist named Ken is targeted by the shark. An orca intervenes and kills the shark, saving Ken's life. This switches Nolan's target to the orca. Later while hunting with his crew, Nolan tries to capture what he believes to be a male orca, but mistakenly harpoons a pregnant female. Nolan and his crew get the orca on board, where she subsequently miscarries. The captain tosses the dead fetus overboard as her mate looks on, screaming in anguish. Seeking release for his near-dead mate, the male orca tries to sink the ship. One of Nolan's crew members, Novak, cuts the female off the ship, but the male leaps up and drags him into the sea too. The following day, the orca pushes his now-dead mate onto shore. Al Swain berates Nolan on his actions after finding the dead whale. Nolan denies responsibility, but Swain and the villagers eventually find out his involvement. The villagers insist that he kill the orca, as the latter's presence is causing the fish that are vital to the village's economy to migrate. The orca then terrorises the village by sinking fishing boats in broad daylight and then breaking fuel lines, thus destroying the village's fuel reserves. Dr. Rachel Bedford, a colleague of Ken's and a whale expert, shows him how similar whales are to humans and tells Nolan that, "If he [the orca] is like a human, what he wants isn't necessarily what he should have." Nolan confesses to Bedford that he empathizes with the whale, as his own wife and unborn child had previously been killed in a car crash caused by a drunk driver. Nolan promises Bedford not to fight the whale, but the orca attacks his seafront house containing an injured crew member of Nolan's, Annie, within it. The house starts slipping into the sea and the whale bites Annie's left leg off. 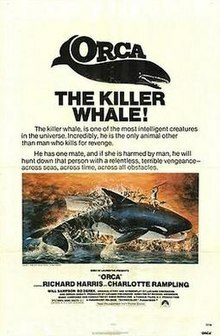 Nolan decides to fight the orca, although with Novak dead and Annie maimed and unable to help, Nolan and Paul are now the only crew members left. Bedford and Ken join the pursuit, along with a Native American man, Jacob Umilak, enlisted for his knowledge on orcas. The crew begins to follow the whale after he signals Nolan to follow him. Ken is leaning over the side when the whale surfaces and grabs him, killing him in the process. They follow the whale until they reach the Strait of Belle Isle, though when Paul starts to get into a lifeboat, the orca knocks Paul out of the boat and drowns him. The next day, the whale shoves an iceberg into the boat and starts to sink it. Nolan manages to harpoon the whale just before he and Bedford escape from the boat, while Umilak is crushed beneath an avalanche of ice just after sending out an SOS. Nolan and Bedford hide on an iceberg, although Nolan slips onto another. The orca separates the icebergs, trapping Nolan. The whale jumps onto the ice, causing it to tilt and sending Nolan into the water. The whale lifts Nolan up with his tail and throws him onto another iceberg, killing him. Bedford looks on helplessly as Nolan slips into the water in a cross shape. With his revenge complete, the whale swims southward under the ice, while a helicopter is seen coming which, presumably, will rescue Bedford. As the credits begin to roll, the orca is shown swimming beneath the thick Arctic ice and butting his head against it, attempting unsuccessfully to surface for air. Though his fate is ultimately uncertain, it is suggested that the orca will likely drown beneath the ice, his revenge having cost his own life as well. Other viewers have alternatively suggested that the whale, with his revenge done and his rage gone, is left with only the feeling of devastation and loss and is seeking to end his own life by drowning. Producer Luciano Vincenzoni was first assigned to give the film a head start after being called by Dino de Laurentiis in the middle of the night in 1975. Upon admitting that he had watched Jaws, Vincenzoni was instructed by de Laurentiis to "find a fish tougher and more terrible than the great white". Having had little interest in sea life beforehand, Vincenzoni was directed to killer whales by his brother Adriano, who had a personal interest in zoology. Filming took place largely in Newfoundland during the fishing season. Most filming took place in the town of Petty Harbour, about 15 kilometres south of the capital city, St. John's. The main orcas used for filming were trained animals from Marineland of the Pacific and Marine World Africa (Six Flags Discovery Kingdom), though artificial rubber whales were used also. These models were so lifelike that several animal rights activists blocked the trucks transporting them, confusing them for real orcas. The shark used early in the film was captured by noted shark hunter Ron Taylor. The scenery meant to represent a remote polar region of Labrador was fabricated in Malta by designer Mario Garbuglia. The 46-year-old Richard Harris insisted on performing his own stunts in the polar sequences and was nearly killed on several occasions. Reception towards the film was negative. While praise was given towards the soundtrack by renowned composer Ennio Morricone, many have criticized and dismissed the film due to its similarities to Jaws. Richard Harris enjoyed his experiences during filming and took offence at any comparison between Orca and Jaws. Currently, the film holds a 7% approval rating on Rotten Tomatoes based on 27 reviews with the consensus: "Content to regurgitate bits of better horror movies, Orca: The Killer Whale is a soggy shark thriller with frustratingly little bite." ^ a b De Laurentiis PRODUCER'S PICTURE DARKENS: [Home Edition] KNOEDELSEDER, WILLIAM K, Jr. Los Angeles Times 30 Aug 1987: 1. ^ "Remembering the Horror of Orca, The Killer Whale!". BloodyDisgusting. This page was last edited on 5 April 2019, at 15:39 (UTC).